Through its innovation projects, EIT RawMaterials supports new entrepreneurs and intrapreneurs to turn their innovative ideas into business opportunities through their innovation ecosystem. This aims to leverage impact through the creation of synergies and will provide a powerful way of maximising opportunities in the raw materials sector and securing the raw materials supply for Europe. Operationally the projects are managed through the Innovation Hubs, which also support the partners in their search for new, innovative projects. Up-scaling projects are innovation projects based on validated technologies that need additional step(s) for up-scaling, demonstration or implementation. The objective is to bring the technology to market, as a product, service or process. The technology must be at Technology Readiness Level (TRL) of at least five at the beginning of the project, and corresponding to a “technology validated in relevant environment”. At the end of the project, the technology is expected to have reached a TRL of at least seven, corresponding to a “system prototype demonstration in operational environment”. The Network of Infrastructure (NOI) Accelerator Programme intends to support the second phase of project development: commercialisation, within a two-year framed programme. Become self-sustainable within a two-year period. EIT RawMaterials aims to build up Europe’s mineral extraction industry, providing opportunities through the development of innovative, smart and efficient technologies, specialist higher education with an added focus on entrepreneurship, and integration of the entire raw material value chain. When it comes to processing, European industries and research institutions have both long-standing experience and an extensive knowledge base but still these modern-day solutions face a number of challenges. EIT RawMaterials supports and facilitates the improvement and creation of innovative processing methods and technologies. 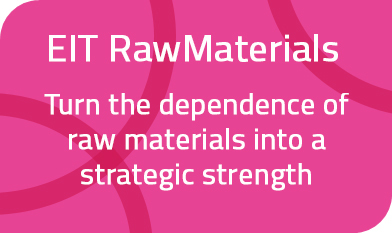 EIT RawMaterials has identified substitution as a pillar of its strategy to turn raw materials into a major strength for Europe. The current portfolio encompasses projects on topics including energy storage, magnetic materials, hard materials, lightweight design, and materials and systems modelling. The Innovation Community supports innovation projects and new businesses that scale up and introduce new technological solutions to the market. These are aimed at improving both the amount and quality of raw materials recovered from secondary sources, that is, end-of-life products, industrial residues, tailings, and urban and landfill mining. The challenge for EIT RawMaterials is to fully utilise the potential of industrial symbiosis by applying a systemic perspective and revitalising human capital in the raw materials sector through two strategic objectives: designing solutions and closing material loops.